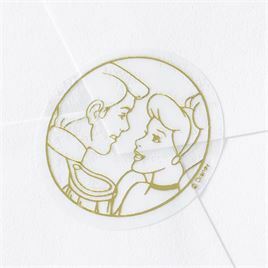 All the romance of a fairy tale swirls around the announcement of your special news on this wedding invitation inspired by Disney's Princess Jasmine. To top off the look, a swirling magic lamp design is printed in the circular frame that crowns your wording on this white invitation. Your wording is printed in your choice of up to two imprint colors and two lettering styles. The swirling border and design are printed in the same color you choose for your wording. Bright white inner and outer envelopes are included. I absolutely love this! It's everything I wanted and more for our Aladdin themed wedding!! I love the lamp detail at the top of the invitation.